The tower blends modern architectural sensibilities with the visual cues of its neighbor. The exterior mimics the original resort’s A-frame structure and the building’s shape also creates tremendous views. The pool has a unique water slide, wrapped in glass block. Two-story lobby is filled with woven woods and glass-wrapped columns. The accommodations offer sweeping views. A Sky Way Bridge links the tower to the original resort. 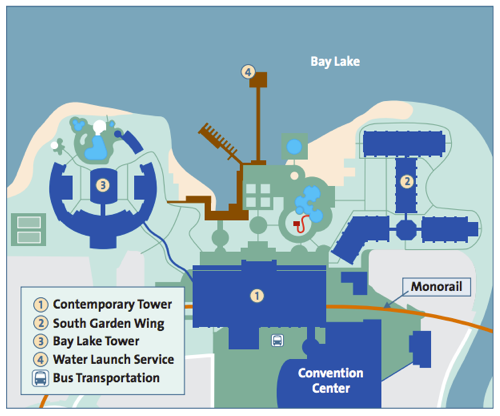 Bay Lake Tower at Disney's Contemporary Resort is conveniently connected by monorail or water taxi to numerous restaurants within the Magic Kingdom® Resort area. Get the Gold Medal treatment at the Olympiad Health Club at Disney's Contemporary Resort. Whether it's a hard-driving workout or a relaxing massage, our trained staff of health and fitness experts is available to assist you with your health and fitness needs. Call for reservations at (407) 824-3410, 8:00 a.m. to 8:00 p.m. daily.